The latest episode of Bond Appetit features me speaking with Rebecca Plant, host of the Boardrooms and Bedrooms podcast. Rebecca’s show is all about navigating the complexities of a working relationship — an arrangement where partners are running or working within a business together. As you might imagine, this isn’t the easiest thing. But Rebecca and I, both of us being in working relationships ourselves, have a few bits of advice for keeping things running smoothly. When you’re working together with your partner, there is a lot of room for personalities to clash. Because you already have a certain level of intimacy and comfort with this person, you’re more likely to let the more selfish parts of your personality come out. This is where disaster can strike. Understand that each person in your relationship is just as valuable as the other, and make sure that neither partner is lording over the other with their ego. “Frank and open conversations are absolutely the cornerstone of any great relationship.” This was something that Rebecca said during our talk I think is an absolute golden nugget of truth. Luckily, we’re living in a time where it’s encouraged for partners to tell each other how they’re feeling. Openness and honesty keeps grievances from piling up and resentment from building. Make sure you’re voicing your concerns with your partner or they’ll be quick to bring toxicity to your relationship. The beautiful part of being in a relationship is that each person offers something unique. Maybe one partner is an extrovert, while the other is more introspective. That means that the outgoing person might be better suited to handling speaking engagements or other social functions, while the quieter partner could be better at writing copy, figuring out goals or having one-on-one meetings. It’s different for every couple, and it’s your job to figure out the dynamic in your relationship. What do you want to accomplish in your business? That’s an obvious one. 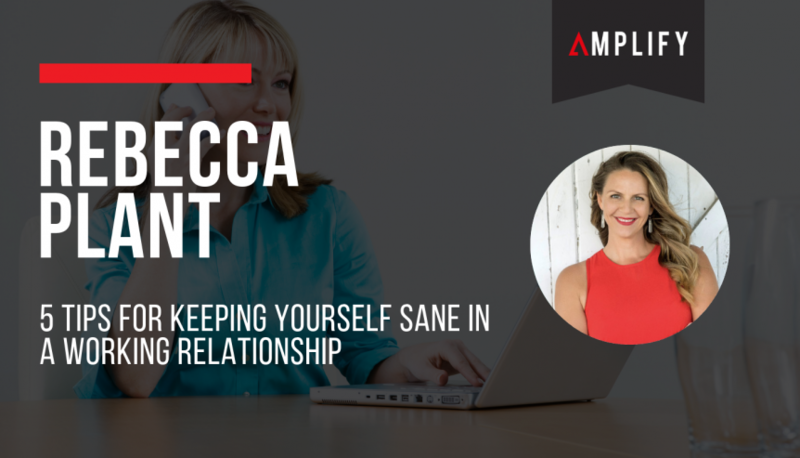 But have you thought about how you want your relationship to grow within your business? Or how you want to personally grow within all of these different dynamics? It’s also critical that there are clear boundaries. Understanding what each partner is responsible for can keep confusion from arising over who was supposed to do what. At the end of the day, don’t give yourself a hernia stressing about all of this stuff. Business is about the process, not the product. You should be enjoying most — not all, that’s not realistic — of your days running a business with your partner. You should be growing, laughing and feeling excited about the future. Also, don’t spend too much time comparing yourself to other couples. It’s not a competition; the only people whose opinion you should worry about is you and your partner’s. At the end of the day, have fun and enjoy growing as a couple. Listen to my entire conversation with Rebecca Plant here.